I've been out and about in Ramsgate this morning with council officers, showing visiting Hastings councillors how successful Thanet's 'Seagull Proof' bag campaign has been. Augusta Road, in the photograph, used to be a regular black-bag pecking disaster area before the introduction of bird-proof bags led to the end of the marauding seagull problem. Now,with thousands of these, now liberally distributed across the island's problem areas, Thanet's 'Staffy-sized' gulls are now having to hunt for their takeaway meals elsewhere. Our guests were impressed at how efficient and cost-effective Thanet is at rubbish collection and keeping its streets clean in contrast with the challenges and successes of neighbouring authorities. While we may have well-known pockets in the towns, that absorb a disproportional amount of effort in tidying up, our streets are, in general, as I reminded the Labour Group at Cabinet recently, the tidiest they have ever been with the highest satisfaction rating to match. In the past, it wan't unusual for house-holders of another generation to take a personal interest in keeping the path outside their homes tidy. My own wife (pictured) was bought-up that way and she takes it upon herself to sweep the pavement and remove the weeds from growing under our wall. 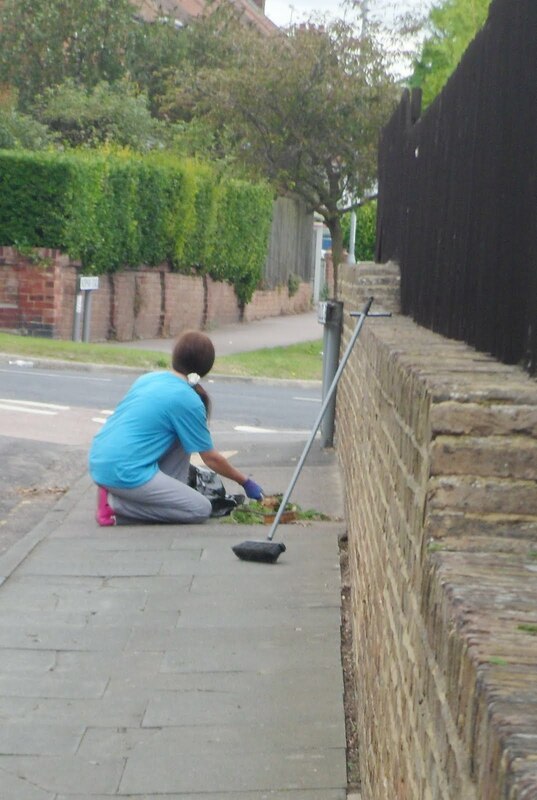 Perhaps if more people followed her proactive example our own streets would be the tidiest in Kent. What about the very hard working council street and beach operative who was seen one very hot day this summer removing all the weeds from your road, I am sure he should get a mention as he does do a lot of work locally! Paul did get a mention and he did a fantastic job of clearing the weeds from the end of the road down to the beach. In fact we will miss him greatly as he was transferred to Ramsgate although I tried very hard to keep him here in Westgate because he's so popular and was our top beach cleaner. In fact he actually lives on the beach front in South Africa and 'Migrates' to Thanet in the summer to work because he likes it here. That's two "In facts" I must be slipping! I agree with you. Not so long ago, it was a matter of pride to many householders to have a neat 'frontage'. It would be a lot easier, of course, if people didn't just drop litter everywhere, I have an 84 foot frontage and go out every day to clear up the rubbish thrown over my fence.As for the weeds, we are not exactly of the 'beaten track' but TDC manage to spray weedkiller twice a year along the fence edge. People just don't take a pride anymore and the whole area suffers as a result. The attitude is - "We pay Council Tax, the street cleaners will do it". Just another example of our failing society. Simon the top picture is of 29 Augusta Road, my family ran this a guesthouse for a number of years, the only curved panes of glass in the road, in the bay window, apparently the only ones to survive WW2. Hey doc, I think you'll find the majority of homeowners of thanet take great pride in all aspects of their houses. What is frustrating is the dog mess - enforcing of this us the council and polices responsibility - and those houses/buildings where ownership is shared or unknown. Any planning application for conversion to flats, or new building of flats, or conversion to hmo's should have within it responsibility to keep the front, garden, walls etc weed free and clear of rubbish. Some new build flats in thanet do not even have space to put a bin. It's not a surprise rubbish is an issue. Inside maybe but outside we have rather too many properties that show no interest at all in preserving the street scene! How one relates a planning application for an approved development with an obligation to the residents I don't know. I'm afraid we can't simply make up regulations as we go along. I sweep the street and weed it in front of my house, because nobody from the Council has done it for months. Just got sick at their blatant laziness. I started doind this 3 or 4 years ago. So, does that mean I'm paying Council Tax for nothing? Do I get a reduction in my Council Tax for doing their work for them? Our streets are cleaned based on priority, resource and a rota. There is no army of street cleaners and Thanet has a 96% satisfaction rating, the highest every, thanks to seagull proof bags and wheelie bins. Each household contributes an average of £30 a year from its council tax to collect its rubbish annually which is a pretty good result. Remember that if the council relied simply on your council tax contribution to provide its hundreds of different services then you would only receive a fraction of what you presently have.